The University of Nebraska at Omaha (UNO) is one of the healthiest place to work, according to the American Heart Association (AHA). For the second consecutive year, UNO received the Workplace Health Achievement Bronze award from the AHA. The award was presented on Tuesday, Nov. 6, to Cecil Hicks, UNO assistant vice chancellor for human resources; Esther Scarpello, UNO benefits manager; and Doug Ewald, UNO vice chancellor for business, finance and business development. 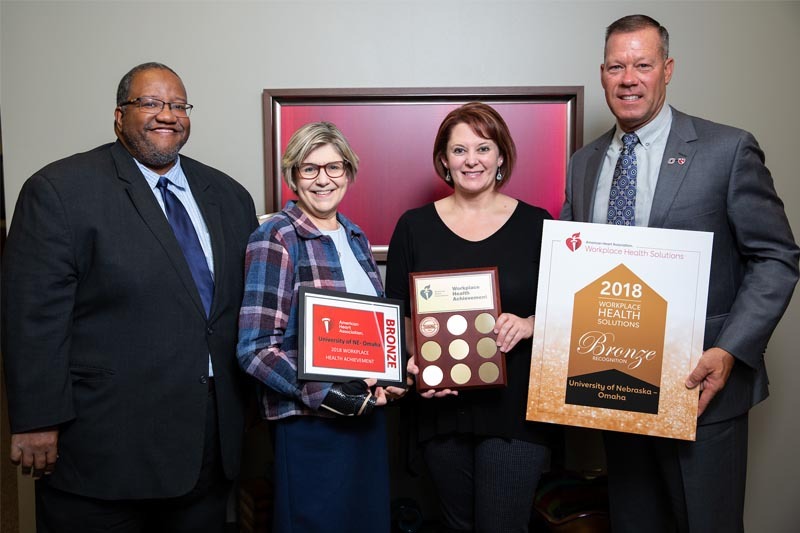 Known as the “American Heart Association – Workplace Health Solution Award,” recipients are scored through the Workplace Health Achievement Index, which is based on best practices that comprehensively evaluate the culture, structure, processes and outcomes of a workplace’s health program. UNO was also recognized last year by the American Diabetes Association with its “Health Champion Award” and by Governor Pete Ricketts in 2016 with the Nebraska Governor’s Wellness Award. Esther Scarpello, UNO’s benefits manager, has been instrumental in leading the efforts to submit the applications for the American Heart Association Workplace Health Solution Award and the American Diabetes Association-Health Champion Award receiving programming support from the Zach McGee, Campus Recreation Assistant Director for Wellness and Aquatics. To see what kinds of opportunities UNO offers its employees to improve their 8 dimensions of wellness, visit the University Wellness webpage. Employees are also encouraged to seek out other health and fitness opportunities through Campus Recreation; such as memberships, fitness classes, injury prevention and more.